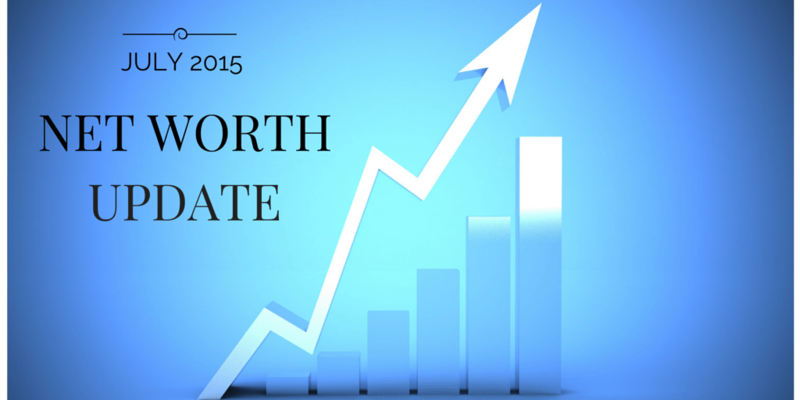 This is my official Net Worth Update for July 2015. 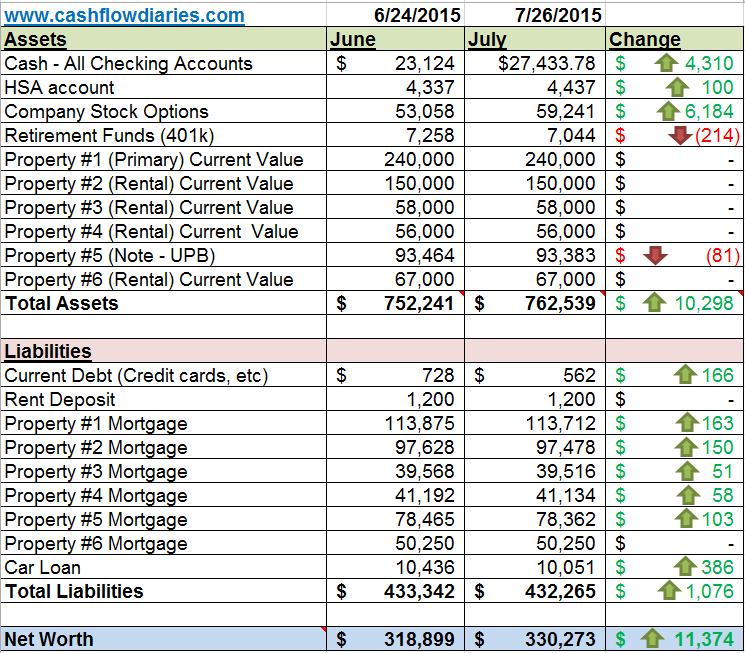 Below are my actual numbers for ALL my investments and liabilities as of 7/26/2015. Explanations and quick summary below chart. My net worth grew by $11,374. I was actually expecting a smaller increase due to a bunch of unusual costs I had. This month I had to replace a Fence on one rental and an Oven on another rental. Not to mention I took a vacation out of the country. This is very pleasing to me to see it grow but to be honest the only reason why it grew so much was because of my company stock options from my day job. It continues to go up and it is really making an impact on my net worth. I mean don’t get me wrong, I dread working a day job but this is clearly one of the perks of having a day job so I will not take it for granted and enjoy these perks for now. This constitutes two different checking accounts. My normal checking account and my REI (Real Estate Investing) checking account. This is literally only the 3rd month I have ever been tracking my net worth and all my financials and I am quite surprised to see my cash go up this much. I’m receiving a good amount of cash flow from the rentals, receiving payment from a personal debt I had loaned out and with my day job income, this is all what is constituting for this increase. Very Satisfied! These are stock options from my day job. I am fully vested. This number can go up and down it has pretty much just always kept going up. It went up a significant amount just in this past month and it makes me very happy. I’m anticipating on these stocks to continue to grow based on the fact that is has never decreased. I am not planning on cashing these out unless it’s an emergency situation. Extremely Satisfied! I made an executive decision awhile back to take money out of my 401k and no longer contribute any more money to it. Mainly because I do not get matched contributions from the dreadful day job. But also because I KNOW I can make better returns using that money on rental properties. I really don’t like the idea of having an account that punishes me to take money out because of age. I am not surprised that this number went down and I honestly have no idea what it will do in the future. I suspect it won’t significantly impact my net worth. Not Satisfied! This is my first rental property. It used to be my primary residence. I expect gradual appreciation from this property as well because it is in the suburbs of this HOT market I live in. Love me some HOT markets! 150K is about what its worth now based on MLS comparisons. I will update the market value of this property in the spring of 2016. Rent paid in full and on time. I replaced the oven on this rental this past month and the tenant is still paying on time and appears to be a happy camper. As am I! Satisfied! This is my first turnkey rental property I purchased out-of-state. I do not expect much appreciation on this property. I purchased this for CASH FLOW purposes only. Rent paid on time. No repair or issues reported this past month. Tenants are happy, my PM is happy and I’m happy. Satisfied! This my 2nd turnkey rental property. I do not expect much appreciation on this property. I purchased this for CASH FLOW purposes only. Rent paid on time. The tenant asked me to put in a new fence for their dog and I did. It didn’t cost a lot of money and I want to keep the tenant happy. Plus I know this fence will come in handy for future tenants. Satisfied! This is my newest rental, just purchased it in early June and I absolutely love this house. I got paid July’s rent payment on time and I still have not had to pay a mortgage payment on this one because I only closed on it in June. First mortgage payment is in August. So for two months, I get to see extra cash flow on this. Pretty awesome! No repairs or issues for July. Satisfied! Consistent growth through out the month with a few dips but overall, it’s heading in the right direction! WhooHooo! Hey, congrats on increasing your net worth! It is exciting to see that thing grow like it has. With regards to your 401k, I think that that is a very interesting strategy to pursue. So many people just blindly throw money at their 401k. Like you said, you will be able to get much better returns from rental properties. This is just like how people could probably invest in other things much better than their 401k and be able to touch this money whenever. Keep it up and have a good August! Thanks for commenting Erik! The whole 401k debate can be vicious. I’ve seen countless debates on this subject on other forums. I agree that it can be a great plan for people that don’t know how to invest but for me and a lot of others I have spoken to, it is not a good option. It’s all about what else you could do with that money and actually using that money to get better returns. Thanks! Yes I hope August is comparable. We’ll see! That’s an interesting take on why you expect your stock options to continue to rise. I would think that anything that appreciates as fast as those stock options is pretty darn volatile. Your not worried, also, that 70% of your non-property assets are Ina single stock? I dunno man. I think some diversification wouldn’t hurt. You make valid points for sure. The reason why I expect them to rise is because I have worked at this company for close to 5 years now and I have seen where they came from and where they are going. It is actually a super cool company and we have a super bright future ahead of us. I have been there this whole time as we rose to where we are at now and don’t see this train stopping anytime soon. As far at the 70% on non property assets in a single stock goes, the truth is that those options were granted to me at a dirt cheap grant price. I have not even invested $2000 of my own money into those stocks. Because I have worked there for so long, I was one of the lucky ones to get a really good package on those options. With that being said, all that money and growth is just a huge bonus. I mean the fact that I only put less than 2k to exercise those options and now its worth 59k is a big deal and I don’t feel like I have much to lose since I barely put anything into it. But don’t get me wrong, I love them and want to see the growth continue. I just think it will slow down. I do agree that I need to diversify more however my plan for diversification at this point is to own rental properties in different markets. Once I have enough rental properties to cover all my living expenses I will start dabbling with investing in stocks and stuff. I’m just having a ton of fun investing in real estate that I don’t want to stop. But I hear ya man! I can’t put all my eggs in one basket and it will be something I dabble with changing in the coming future. I would advise to keep pumping money into your HSA, if you have investment options. It comes out pre-tax, even pre-medicate and FICA. Keep up your 401K, that will be your liquid money. Rentals are great, but even I max out both the HSA and 401K. Eric! Thanks for stopping by. You know I have thought about that over and over again and just can’t wrap my head around the fact that it will just end up being taxed and hit with penalties when I want to take it out. I do need to diversify into other investments for sure but I just need to figure out exactly what my best option is. I’d almost rather just get a self directed IRA. Just don’t have enough knowledge on anything other then real estate at this point. I’m with Eric on this one. The stock market looks like it’s about to go on sale and I would divert some money to that 401k and max out your HSA. I own many rentals, I collect two pensions, and I maxed out my IRA’s and 457 plans. It’s that multi legged income stool that you should be looking for. You will not be hit with penalties if you strategize correctly. I really appreciate the feedback. Thanks for commenting! I completely understand where you are coming from. It just is so hard for me to put money in my 401k and HSA when I know I can make better returns putting it in rentals. For diversification purposes, I know its the smart thing to do. I just need to do it already. Really tough battle for me to do it though. I had made a note to myself to come check out your Net Worth reports and then I forgot. You are killing it. Congrats on the 3rd Turn Key real estate investment. I am looking to get in the Real Estate cash flow investing game in January. Been listening to Jason Hartman and checking out the properties on his site. We currently own our primary residence and an investment condo. So we will be gearing up to take on a 3rd property. I am just amazed at the kind of prices you can get outside of California. The cash on cash returns seem pretty amazing. I was pretty skeptical at first, but I am starting to grow a level of comfort. The thing I like about the properties through Jason Hartman’s site is that they have area specialists that help you choose property managers and any other resource you could need in the area. From a tax standpoint you must be killing it with all that depreciation??? I have always been an equities and options guy, but the more research I do, the more I am realizing the multi-dimensional nature of real estate. Looks like you’ve got a sweet deal with the company you’re working at..